Racing through the pain barrier, Jeffrey Herlings (Red Bull KTM) returned to action with a plated collarbone at the MXGP of Indonesia where he traded moto wins with team-mate Tony Cairoli to claim a sensational victory and stretch his total to nine overalls from 11 starts. After breaking his collarbone practising less than three weeks ago, the 23-year-old was forced to sit out the previous GP in Italy where Cairoli took a maximum score to close to within 12 points of the Dutchman. 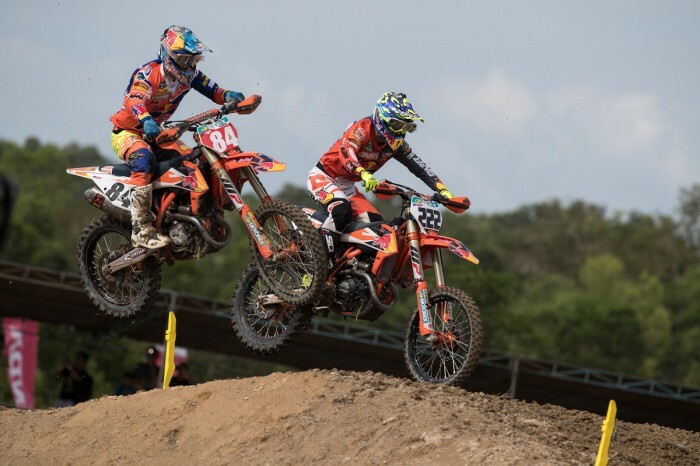 Cairoli headed into round 12 of the FIM Motocross World Championship at Pangkal Pinang aiming to reduce this gap even further and victory ahead of Herlings in the opening 30-minute plus two lap race suggested the reigning champion would do exactly that. No-one had shown Herlings the script however and after taking an early lead in the second moto he resisted late pressure from Cairoli and survived a dramatic final three laps that saw both men fall to maintain his advantage at 12 points and keep hold of the red series leader’s plate. “I felt I was not out of control but I made too many mistakes,” said Herlings. “The track was choppy but the bike was awesome and I felt good on it so I could just push to the limit of what I’m capable of right now. It’s great to come back with a win and I’m very happy with that. Herlings took his fifth holeshot of the season in the opening moto from Cairoli and Gautier Paulin (Rockstar Energy Husqvarna) with Clement Desalle (Monster Energy Kawasaki) in fourth ahead of Tim Gajser (Team HRC). The leading pair quickly began pulling clear as Gajser took a lap to move up to third. Cairoli was all over Herling’s rear wheel and on lap five he made a pass stick and then checked out, winning by almost 10 seconds. After passing Gajser just after the halfway mark, Desalle came home a couple of seconds behind Herlings with the Slovenian comfortably clear of fifth-placed Romain Febvre (Monster Energy Yamaha). Race two was a classic from the drop of the gate with Herlings taking the holeshot by a tyre’s width from Cairoli who then moved ahead before both were passed up the inside by Gajser. Herlings stuck back almost immediately to re-take the lead and then Cairoli and Gajser traded passes with the Italian eventually coming out on top before they had even completed a lap. After two laps Herlings had opened up a three-and-a-half second lead and then Cairoli fell which allowed Gajser to go through. Remounting just in front of Febvre, the nine-time champion quickly refound his rhythm and within a lap was back ahead of Gajser but by this point Herlings was almost nine seconds clear. Lap after lap Cairoli gradually reeled in Herlings and with two minutes and two laps left he’d got the gap down to just over four seconds. With time running out Herlings then fell in the right-hand turn before the finish line and Cairoli swooped, only to go over the bars on the following lap. At the flag it was Herlings by 10 seconds from Cairoli with Febvre passing Gajser for third to secure the final step of the podium. Britain’s Max Anstie (Rockstar Energy Husqvarna) struggled to 11th in the opening moto but despite the hot and humid conditions he picked up the pace in the final 10 minutes of race two and passed Desalle and Paulin for sixth behind Glenn Coldenhoff (Red Bull KTM). Tommy Searle (Bike It DRT Kawasaki) ran 16-12 but there was no fairytale return to Indonesia for last year’s overall winner Shaun Simpson (Wilvo Yamaha) whose 18-19 finishes added just five points to his season’s total.